Whether you’re snacking on a dumpling, feasting on roast chicken or crunching down on fresh vegetable crudités, a good dipping sauce can make all the difference. Here, 11 recipes for dipping sauces for every occasion. Padma Lakshmi calls this sauce “liquid heaven.” She purees sticky dates with fresh mint, lemon juice and chile, creating a sweet, bright-flavored and slightly spicy sauce. It’s stellar with kathi rolls but also great on a sandwich. 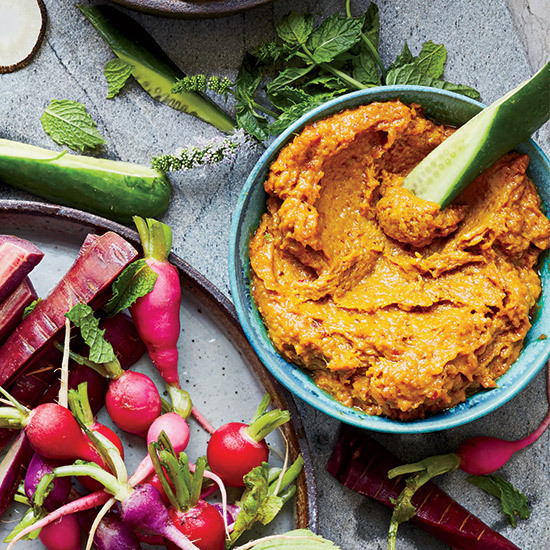 Coarse, flavor-packed peanut butter is incredible in this fragrant Burmese-inspired dip. Try it with raw vegetables. This four-ingredient sauce is super-simple to make and is delicious with any type of dumpling, from pork to tofu. Chefs Daniel Patterson and Roy Choi season their awesome tomato-based spicy sauce with Korean chile paste and use it with everything from fries to onion rings to chicken. This indispensible dipping sauce is served with every Vietnamese meal. Superquick and vibrant, this terrific sauce is best with grilled shrimp or fish. The perfect dip for artichokes. Serve this piquant sauce with juicy meats like lamb. Though this sweet-salty Indonesian dipping sauce is sensational in its own right, it’s best with grilled beef, poached chicken or grilled salmon. This tangy sauce is essential for crispy tempura. A touch of fish sauce gives this sweet, sticky sauce terrific complexity. Serve it with grilled chicken.